We have been designing and manufacturing laundry machinery and installations for many years. This is why, today, we are able to say that we are real experts in this field. We have a wide range of washing, drying and ironing machines. This new generation of washers combine the latest technology with the best quality in components and materials. They are equipped with the most advanced technology in water and energy saving systems, as well as the WET CLEANING feature. 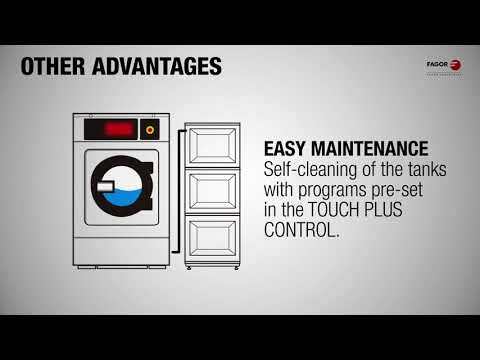 Its user-friendly and intuitive programming makes them suitable for all types of laundries, dry-cleaners, self-service and commercial or industrial laundries, hospitals and care homes. The new FAGOR INDUSTRIAL dryers arrive in the market as a real revolution on the drying process. The new developments in our machines allow a much higher efficiency than our previous models and make them the most technologically advanced dryers in the market. New flatwork ironers, models with lengthfold, crossfold and stacker and the choice of rear or front delivery, offer great flexibility to adapt to all type of needs and uses. Fagor ironers are conceived to offer the best performance and productivity with noticeable energetic efficiency and time-saving. Their easy operation makes the maintenance costs almost nonexistent. The ironing quality from Fagor machines is well known by the users and considered one of the strong points. We have a wide range of accessories for the different laundry processes. This includes all types of trolley, including moveable bottom trolleys, wet linen trolleys, transport trolleys and clothes hanger trolleys.